The software, systems and IT development communities are constantly looking for approaches to organize and manage their work. Over the years there have been many solutions to choose from. These include the Project Management Body of Knowledge from the Project Management Institute (PMI), the Capability Maturity Model (CMMI), Integrated Product Development, Concurrent Engineering, and Integrated Product Teams. All of these work when used in earnest. Scaled Agile Framework (SAFe) is a recent software and systems development framework that implements Agile at the enterprise level. It also incorporates practices from Lean Product Development and Extreme Programming (XP). Similar to other frameworks and methodologies, it covers many of the practices you need to define and coordinate work activities among teams dependent on each other. This article will briefly compare and contrast SAFe, Scrum and CMMI. 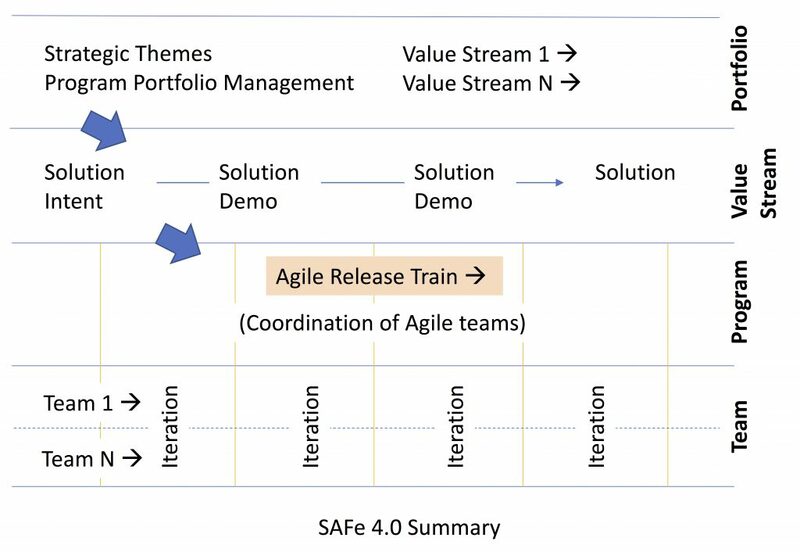 SAFe is a defined set of practices based on Lean and Agile principles to synchronize and align Agile teams in large-scale software and systems development. SAFe 4.0 is designed for large systems and organizations. Essential SAFe is a subset of the practices for Team and Program Management (several teams working together). See references below. SAFe and Scrum are prescriptive ways to define and manage work. After every iteration, feedback is collected on the work via a demo, and improvements are collected on the process via a retrospective. CMMI is a toolbox of practices organized into process maturity levels and categories. A maturity level guides the reader to implement basic practices first, before tackling more advanced practices. The practices can be reshuffled into any shape (life cycle) desired, such as an iterative life cycle (Scrum), a phase life cycle (incremental). Practices can be scaled down to a one-person project or up to a 1000-person organization. CMMI practices can be implemented in the way you want, or by using the examples provided. They can be repeated every sprint, phase or time-box, touched on lightly, or implemented rigorously based on the needs of the project or organization. You can call work a “to-do list,” “WBS,” “sprint backlog,” or any name that makes you feel good! If a group of practices is used, (e.g., a maturity level), then the organization can optionally be appraised and recognized for that fact, based on the defined appraisal rules. SAFe, Scrum and CMMI all have the same underlying premise, that is, to make work visible. The table below is the top part of a summary comparison. Click on the table for the complete version, or click here. Know that no framework, scheme or methodology works unless the organization invests effort, thought and diligence. Similarly, the tool box in your garage does not make your house beautiful by itself! Focus on what you want to achieve by enumerating your delivery goals and current challenges. Go through the frameworks and pick one or two items that help you address the problems and achieve the goals. If your organization is using some variant of Agile and wants to scale those practices for larger systems that cross the enterprise, then look at SAFe. If you are using Agile or SAFe and want to improve your engineering, risk, decision, process assurance, and supplier management practices, look at CMMI. Neil has teamed up with SAFe instructor Charles Maddox of The i4 Group, and will be providing detailed CMMI/SAFe mapping sessions in upcoming SAFe classes. Contact us for more information or immediate help. [Forward this email to your boss! Subject: Here’s a cool tip for you] Quick Link.